Srila Bhaktisiddhanta Sarasvati was born in the holy pilgrimage place of Jagannatha Puri to Srila Bhaktivinoda Thakura, a great Krsna conscious spiritual master in the line of succession coming from Lord Caitanya. Although employed as a government magistrate, Srila Bhaktivinoda worked tirelessly to establish the teachings of Lord Caitanya in India, where, unfortunately, the people had come to neglect the principles of devotional service to the Supreme Lord, Krsna. He envisioned a worldwide Krsna consciousness movement and prayed to the Lord for a son to help him achieve his dream. 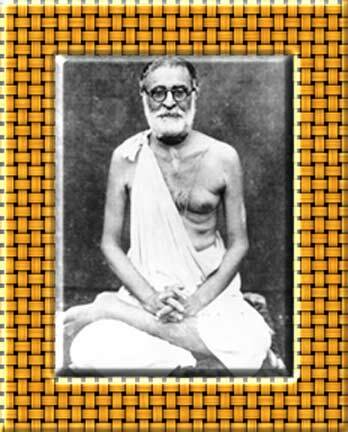 On February 6, 1874, in the sacred pilgrimage town of Jagannatha Puri, where Srila Bhaktivinoda Thakura served as superintendent of the famous Jagannatha temple, Srila Bhaktisiddhanta Sarasvati appeared in this world. He was given the name Bimala Prasada. At the age of seven, Bimala Prasada had memorized the more than seven hundred Sanskrit verses of the Bhagavad-gita and could speak illuminating commentaries upon them. Srila Bhaktivinoda Thakura, the author of many important books and other writings on the philosophy of Krsna consciousness, trained his son in printing and proofreading. By the time he was twenty-five years old, Bimala Prasada had acquired an impressive reputation as a scholar of Sanskrit, mathematics, and astronomy. His astronomical treatise, Surya siddhanta, won him the title Siddhanta Sarasvati in recognition of his immense learning. In 1905, following the advice of his father, Siddhanta Saraswati accepted spiritual initiation from Gaurakisora dasa Babaji. although Gaurakisora dasa Babaji was renowned as a saintly person and great devotee of Lord Krsna, he was illiterate. Satisfied with the humility and dedication of his highly educated disciple, Srila Gaurikisora gave him his full blessings and requested him to "preach the Absolute Truth and keep aside all other work." Siddhanta Sarasvati then proved himself a capable assistant in the missionary work of his father. Upon the death of Srila Bhaktivinoda Thakura in 1914, Siddhanta Sarasvati became editor of his father's journal, Sajjana-tosani, and founded the Bhagwat Press for publication of Krsna conscious literature. Then in 1918, Siddhanta Sarasvati accepted the renounced order of spiritual life, assuming the title Srila Bhaktisiddhanta Sarasvati Goswami Maharaja. For the purpose of propagating Krsna consciousness throughout India, he organized the Gaudiya Math, with sixty-four branches throughout the country. The headquarters of his mission, the Caitanya gaudiya Math, was located in Sridhama Mayapur, the birthplace of Lord Caitanya. He would later send disciples to Europe for missionary work. Srila Bhaktisiddhanta adjusted the traditions of Krsna consciousness to conform with the technological and the social condition of the twentieth century. He considered the printing press the most effective means of spreading Krsna consciousness throughout the world and was himself the author of may important translations, commentaries, and philosophical essays. He was the first spiritual master to allow his renounced preachers (sannyasis) to wear Western clothes and travel in modern conveyances rather than foot. Throughout the 1930s, Srila Bhaktisiddhanta expanded and increased his missionary work and succeeded in reestablishing Krsna consciousness as the leading force in Indian spiritual life. Anxious that his work continue, he urged his disciples to form a joint Governing Body Commission to manage the Gaudiya Math in his absence. On January 1, 1937, Srila Bhaktisiddhanta Sarasvati passed from this world, and his leading disciples and their descendents still carry on his work.